Our driver is an ex-Jordanian Special Forces soldier. Tough, fit – except for the chain smoking, but then even the kids in Jordan are chain smokers. I’m sure at birth, the males already have a three day growth, doctor slaps their bum and shoves a burning Marlboro in their cherub lips. You could have knocked me over with a camel whip when our veteran of the army started playing Celine Dion and Barbara Streisand on the car CD player. It was quite surreal listening to the theme song from Titanic while speeding through the desert. After a camel ride and then a jeep assault on the sand dunes, we arrived at our Bedouin camp: tents, Persian carpets and the ubiquitous Shishas. 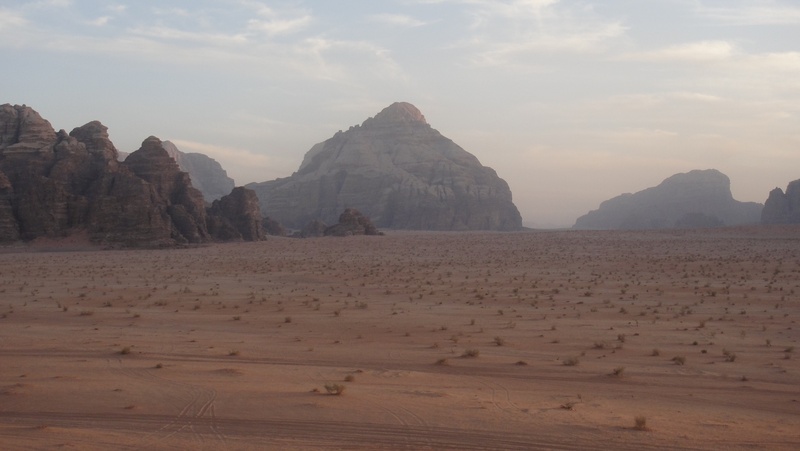 Wadi Rum desert is what I imagine the moon to be like. Desert sand, with red monoliths of rocks honeycombed by wind and rain; towers of striated red, purple, and yellow rising from the dunes. The camp was a little bit touristy, with Bedouin dancers, live music, and even fireworks that echoed off the rock face through the completely dark desert. 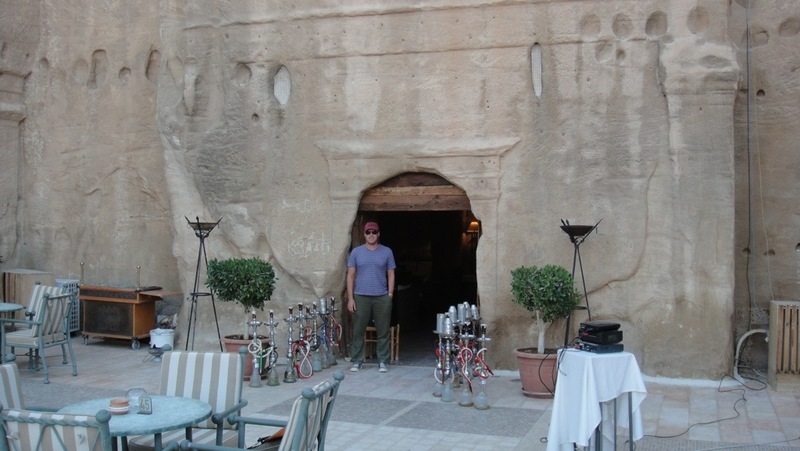 We had the full immersion experience with our own Bedouin tent complete with a sand floor and Persian carpet to keep the sand out of our toes. My travel buddy managed another Shisha. He handled it like an Arab pro, without turning green and coughing like his previous venture. As he sat on a carpet looking like a character from Alice in Wonderland, he mentioned that he had “ticked that box”. Smoking a Shisha seated on a Persian carpet in front of a fire in a Bedouin desert camp. I must check his other boxes, because that one came a little left of centre. Must have been the Shisha talking. So after another Celine Dion-themed drive through the desert in our trusty Hyundai Sonata, following The Kings Highway, we arrived in Petra. Really my main reason to be in Jordan. 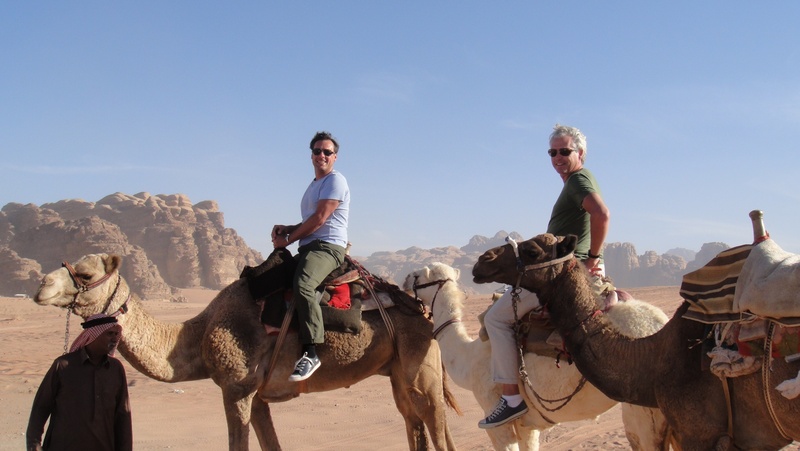 Although I now realise Jordan has so much more to offer, and seven days is not nearly enough. 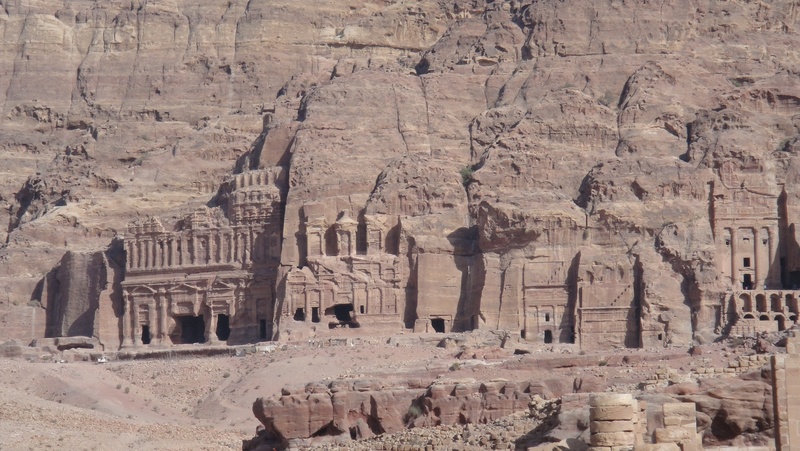 The Lost City of Petra. Rediscovered by a Swiss explorer in the eighteen hundreds, and immortalised in film by Steven Spielberg with “Indiana Jones”. A city that was carved out of red, yellow and purple stone more than two thousand years ago. Built before the Greeks and Romans arrived in this part of the world, with a sophisticated system of water supply, sewerage, entertainment and religion. Remember the Europeans at this stage were still sitting in mud and playing with their own caca. I know this term is overused, but words cannot describe the experience of seeing Petra for the first time. The entry to The Lost City is a 1.5km walk through a narrow gorge, with walls towering 80m above. This winding passageway suddenly opens into a courtyard with the famous pink-hued ‘Treasury Building’ rising dramatically in front. Purposely designed to be a breathtaking entry to this city. Petra is basically a city of tombs. Yep, you guessed it, I’m continuing my favourite past-time of visiting the world’s famous cemeteries. This one is by far the biggest; it’s a massive area of maybe ten square kilometres, most of which is devoted to the dead. 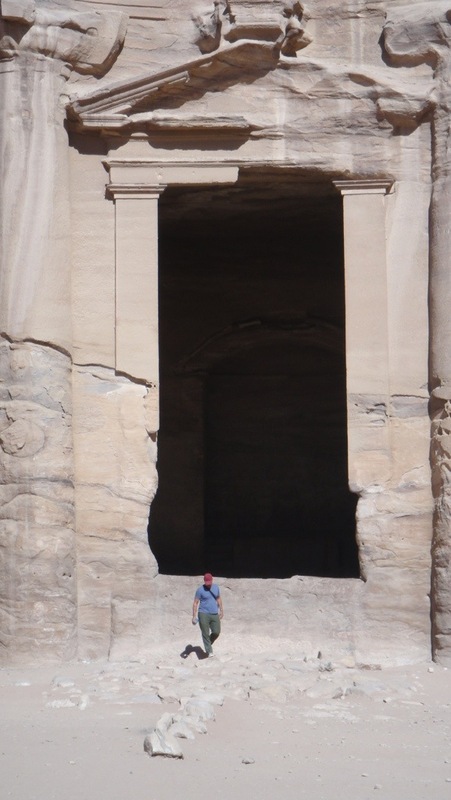 In Petra, it isn’t just a hole in the ground. 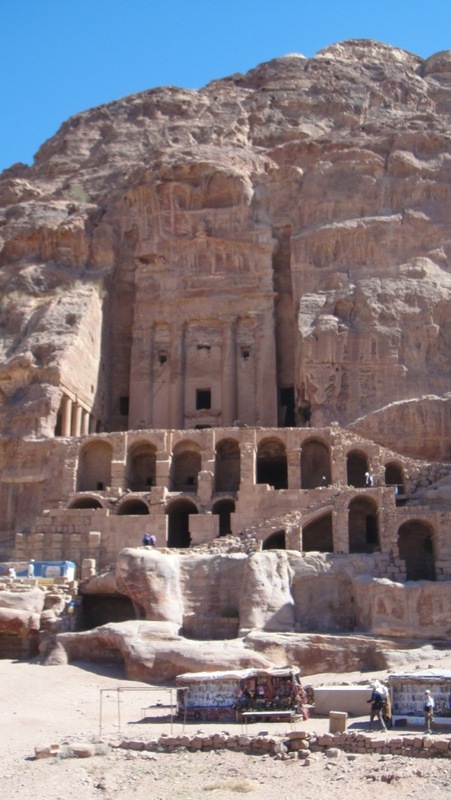 The recently deceased were interned in massive crypts carved into the rock, with doorways framed by pillars hewn out of the sandstone, and statues that range from ten to fifty metres tall. Death is not the end in Petra. Your crypt is a chamber that is large enough to hold a yearly feast/ party to commemorate your death. It’s a wake that keeps on giving. Unfortunately, a lot of the shapes and the carved detail has been lost to wind and water erosion; oh, and the earthquake that flattened the city in 749AD. You know, I can’t even begin to describe the beauty and majesty of Petra with any sort of justice. So I’ll let some photos try to give you a sense of the scale of the place. To round off our day of walking, hiking and climbing, we finished a delicious dinner of mezze and kebabs with a drink in The Cave Bar. Actually a bar set in a burial site. It was quite a bizarre moment as we drank our wine in a two thousand year old tomb, watching FC Barcelona v Real Madrid on a massive flat screen TV. 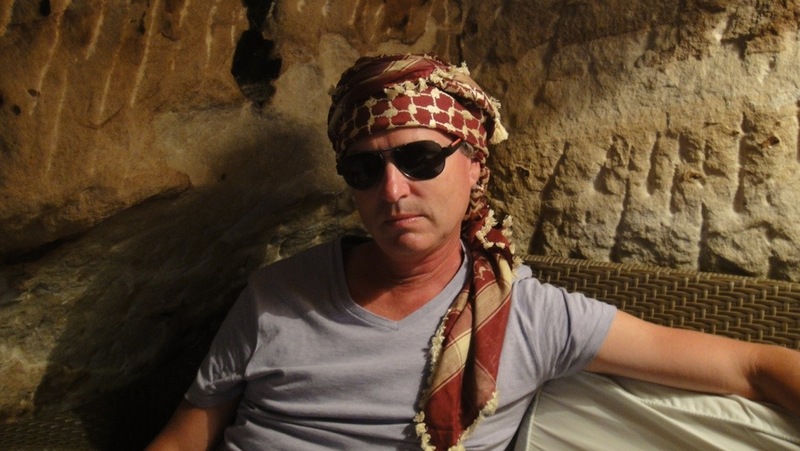 “Lawrence of Arabia” … my Canadian has gone local! Today I’m off with our Barbra Streisand-loving commando to float in the Dead Sea. 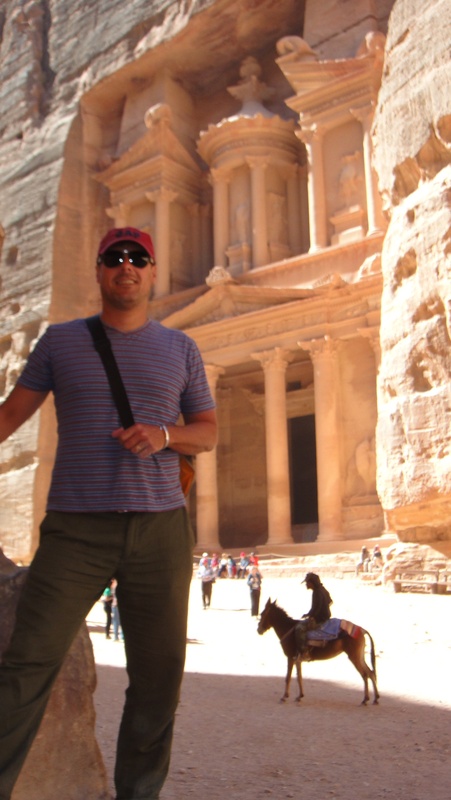 This entry was posted in Jordan and tagged Jordan, Petra, Shisha, The Lost City, Wadi Rum. Bookmark the permalink.